Halloween is approaching and I am always looking for cute treats to send to school for kid's parties. 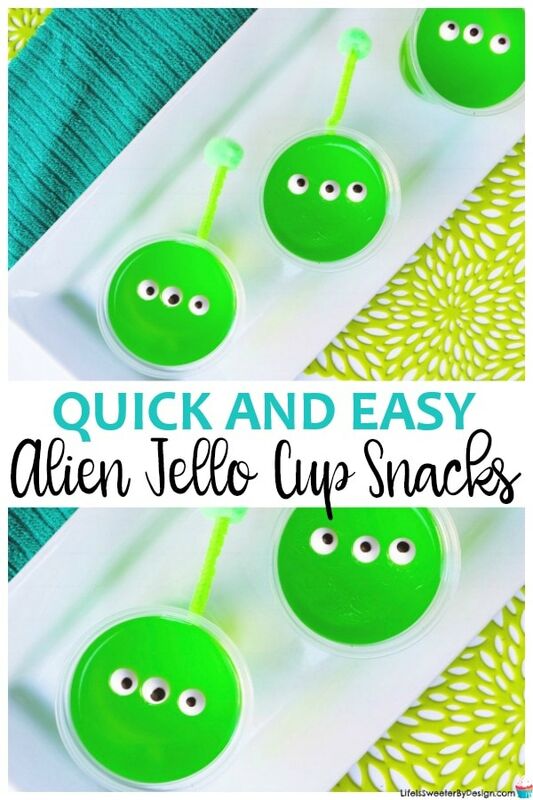 These Easy Alien Jello Cup Snacks are perfect! Boys and girls both love aliens and Halloween is a time when aliens are even more popular. There are so many fun ideas if you are throwing an alien themed party. 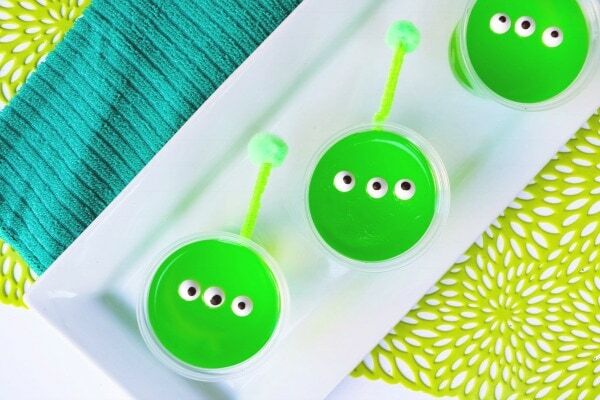 Snacks are a requirement at any kids party and these easy alien jello cup snacks are perfect! Start off by cutting the green pipe cleaners into thirds. Glue a pom onto the end of each piece of pipe cleaner. You can use super glue or even hot glue. If kids are helping don't let them use hot glue guns due to the risk of burns! This will be the alien antenna. Allow the antenna's to dry completely. When that has happened you can glue the antenna onto the side of the small clear plastic cup. Super glue or hot glue work great for this. 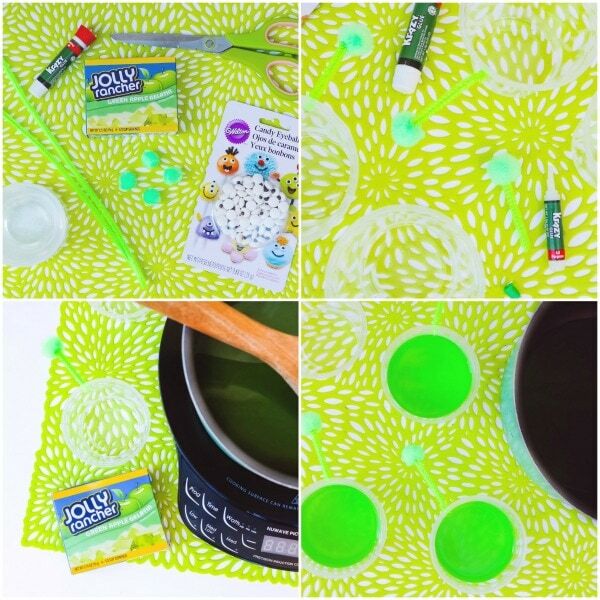 While the cups are drying go ahead and make the green jello. Just follow the directions on the box of jello. I like the Jolly Rancher lime green jello because the color is just right! Each box of jello will make 3 alien jello cups. Depending on how many you want to make…it may take several boxes of jello. Pour the jello into the cups to set up. I like to put the small cups onto a large plate, platter or tray so I can move them easily into the refrigerator to set up. Leave the cups in the refrigerator according to the package directions. Once the cups are set up and you have actual jello you are ready to put the alien eyes on! Take the alien eyeball candies and put the eyes on the jello cup so that it looks like a Toy Story Alien ! Serve these up to the party goers and they will be a hit for sure! What Kind of Party are You Throwing? It is always fun to take cute but easy treats for Halloween parties at school. These easy alien jello cups are perfect for 2 reasons. First they are inexpensive to make and you end up with individual cups so each child will have their own. Kids love anything with alien eyes in my experience! I have seen some of the cutest alien costumes too! This alien costume for toddlers is perfect especially if the weather is cool out. 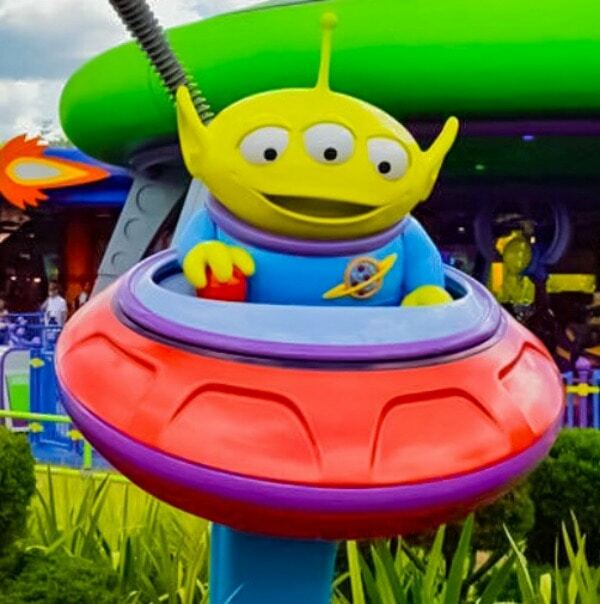 Parents can dress up and get a huge laugh if they wear this Ride an Alien costume…it is HILARIOUS!! Is your child having an alien party or dressing up as an alien this year? Let me know!